I’m referring to the imaginary line that separates Ontario from Quebec and Gatineau (formerly Hull) from Ottawa. The Quebecois take their food and drink seriously and there are many products available in Gatineau that just aren’t sold here in Ottawa, so it’s always fun to go foraging across the border if you know where to look. Today my mother and I stopped at two places on St. Joseph Boulevard of interest to lovers of great food at lowered environmental cost. The First stop was Le Pain D’Alain an artisanal French bakery that only uses organic flours. Besides their wide selection of breads, including a Kamut Sourdough that I purchased, they also carry a range of both sweet and savoury pies that are baked on the premises. I’ve had one of their millet pies and one of their free range chicken pies, both delicious and both bargains–their pies start at just $5.75 for a 9″ one. Besides their own goods, Le Pain D’Alain carries a number of organic Quebec cheeses, eggs, dairy as well as a selection of organic canned, jarred, and dry goods, like tea and jam. 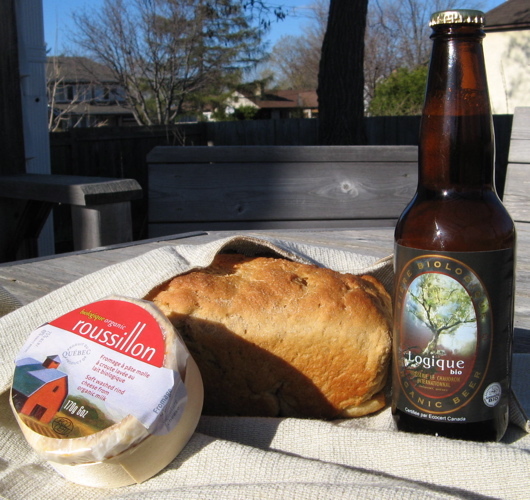 I picked up a soft washed rind cheese made from organic milk in Chateauguay Quebec by Fromagerie L’Alpage. The Second stop we made was at La Boite a Grains, health food store further North on St. Joseph. La Boite a Grains is the size of a small supermarket and carries just about anything you could possibly need including–because it’s Quebec–beer, wine, and cidre. They have an extensive selection of Quebecois “biologique”–that’s French for organic–cheeses as well as produce, cleaning products, vitamins, cosmetics, granola, pasta sauce, etc. Like I said, more like a small supermarket than a traditionally-sized health food store with a selection unbeaten in the region. If you take a trip out there be sure to check out the freezer section which includes wild boar pie and “Dear Pie”. To be completely honest, this trip was a booze run. We went to La Boite a Grains to get Quebec wine and beer that is not available in Ontario, or even at Quebec Liquor Stores (SAQs). I picked up a couple of different white wines from Vignoble des Negondos in Saint-Benoit de Mirabel. The first one, Cuvee Saint-Vincent is a nice crisp and light white wine that I’ve had before. The second, Orelie, I haven’t yet tried, but I’ll let you know when I do. As for my beer purchases at La Boite a Grains, I picked up a six-pack of an organic beer called Logique bio, brewed in Bromont at the Brasserie le Chaudron International. I also bought a six-pack of La Messagere, which is a gluten free beer from Saint-Alexis-des-Monts brewed by Les Bieres de la Nouvelle-France. It’s made with buckwheat instead of a glutenous grain and can be drunk by celiacs. I also purchased a sampler of other beers from Les Bieres de la Nouvelle-France: Claire Fontaine, Blonde d’Epeautre, and Ambree de Sarrasin. “Sarrasin” is French for buckwheat and “epeautre” is French for spelt. The third beer is made out of rice and barley. Les Bieres de la Nouvelle-France micro-brewery uses traditional “artisanal” brewing techniques and is the only beer brewer to belong to the Economuseum network. Again, I’ll post reviews as the bottles get opened. Thanks for this review! My son is at university in Ottawa & I’m encouraging him to “cross the river” to buy me some Quebec butter. With such a wonderful food & booze review (which I sent to him), I don’t think I’ll have to twist his arm.